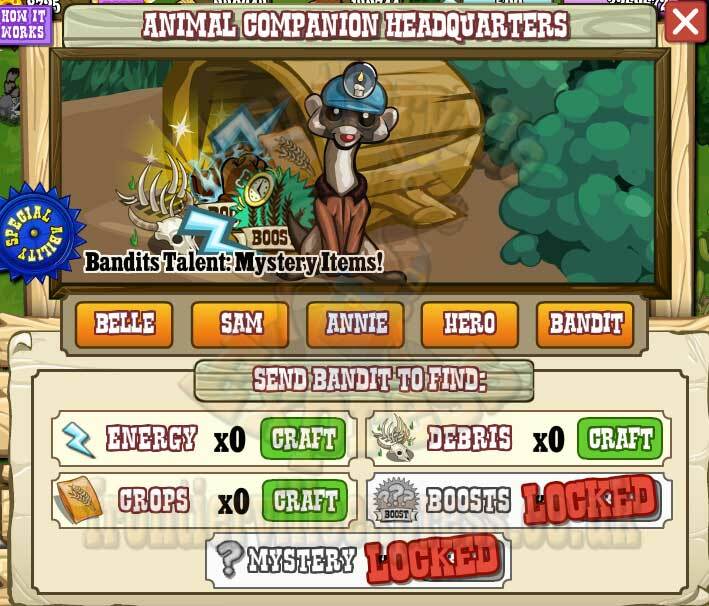 Companions HQ is one of of those builds which isn't so much building stages as story stages. 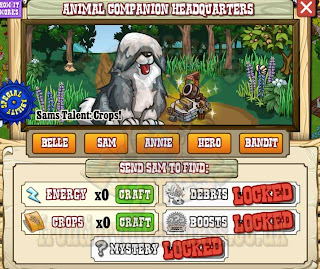 Each one will guide us through what we need to train each special Companion up to Frontier-spec and get them out and about finding us goodies. 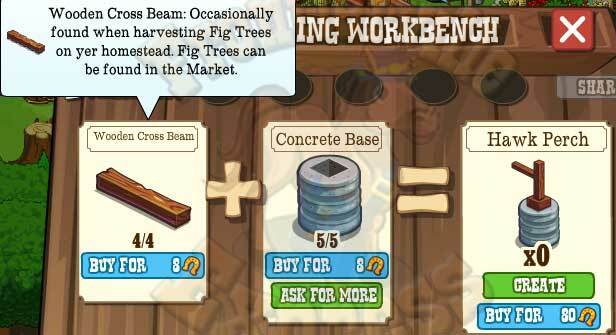 As usual it's a four step build with a mix of requests, crafting and Homestead drops. Little heavier on the crafting this time. 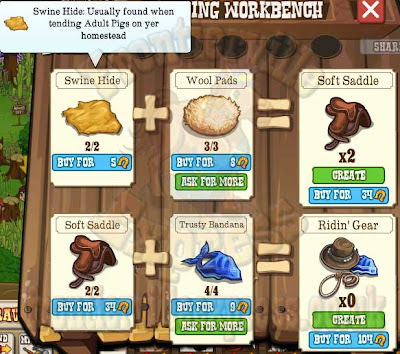 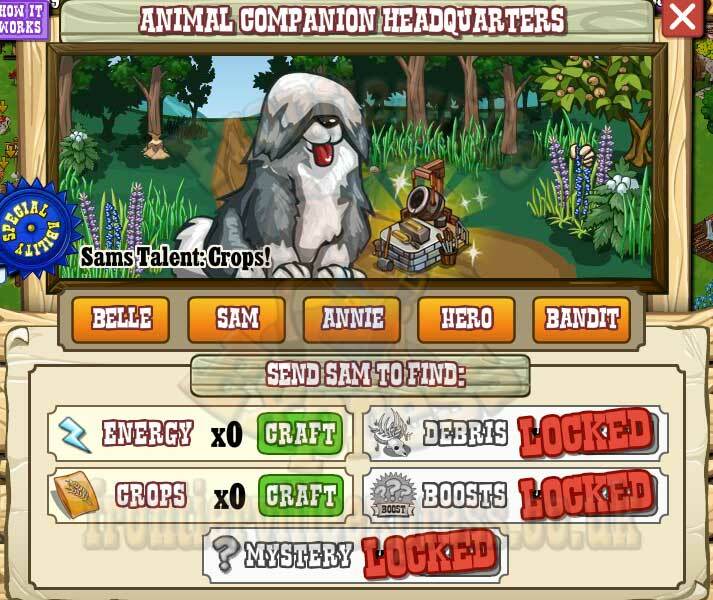 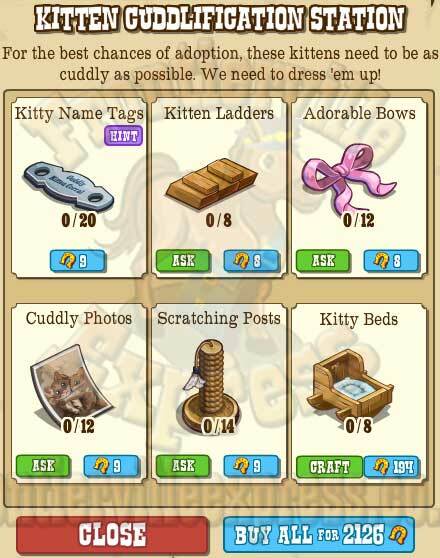 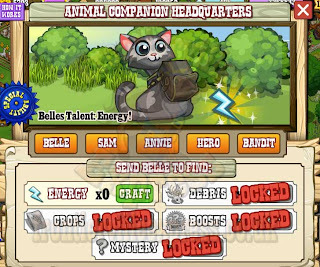 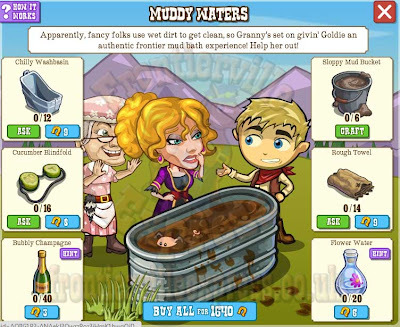 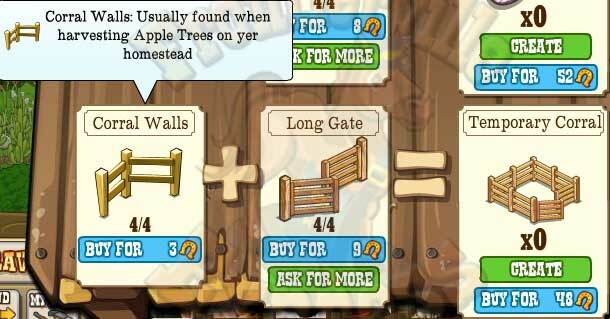 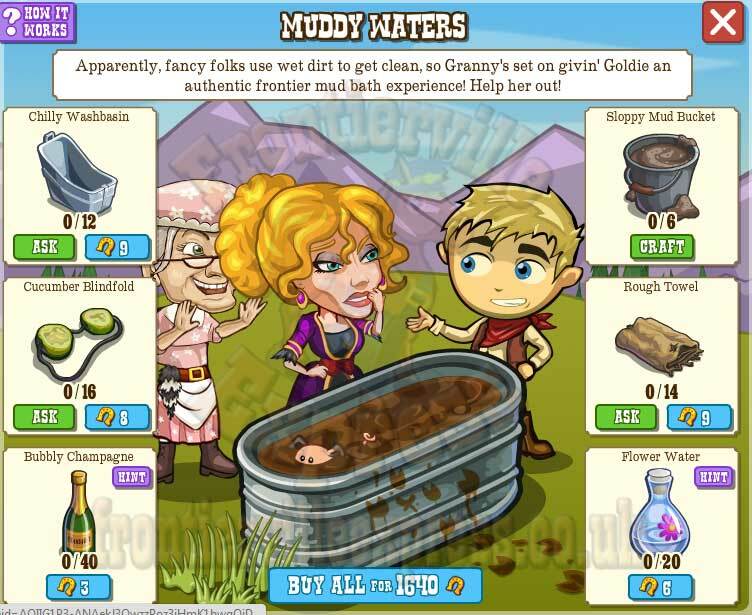 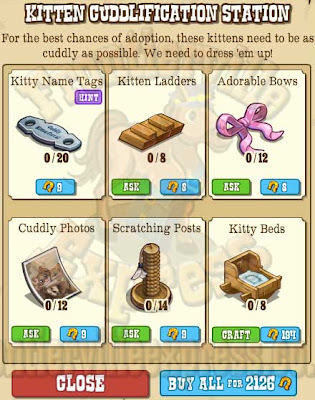 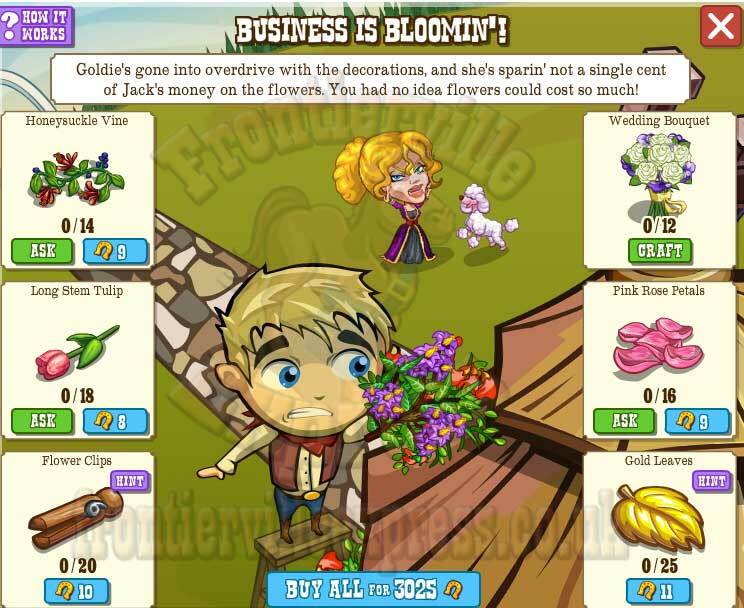 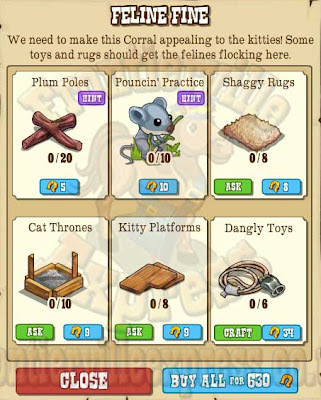 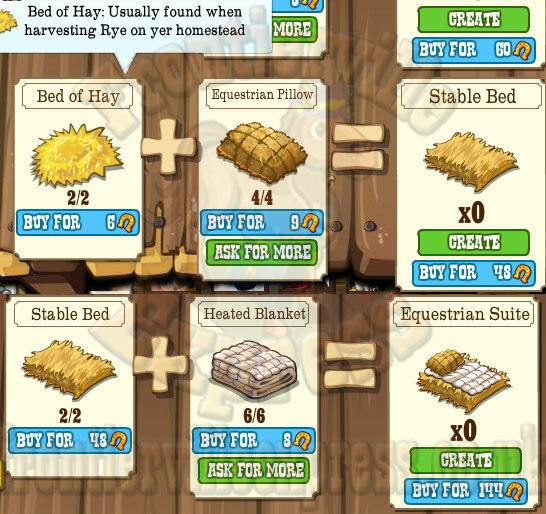 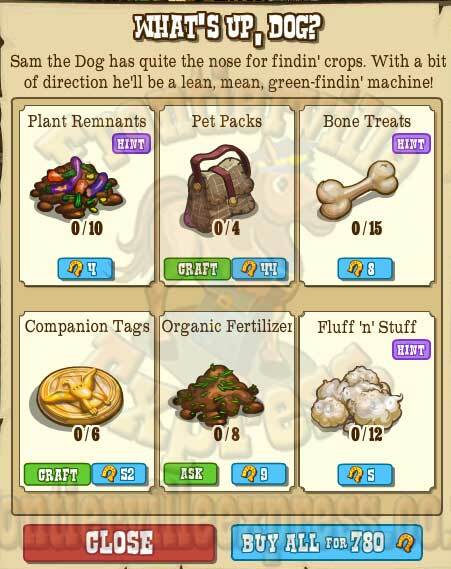 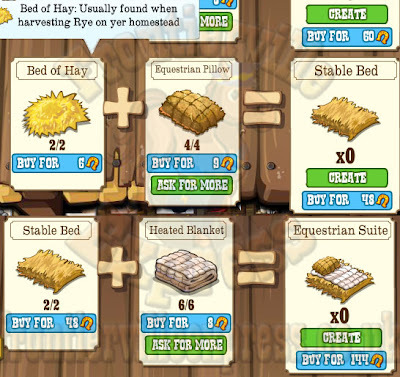 The Animal Companions are a helpful little bunch that can be sent out to find all manner of items on the homestead. But what do they do, and how do we make them do it? Well, that's why we've written this guide! 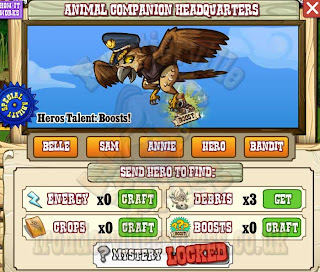 The basics: Each animal can be sent on a job. 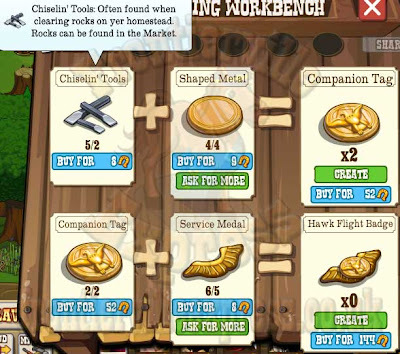 The job takes a certain amount of time and then they return with items for your inventory. 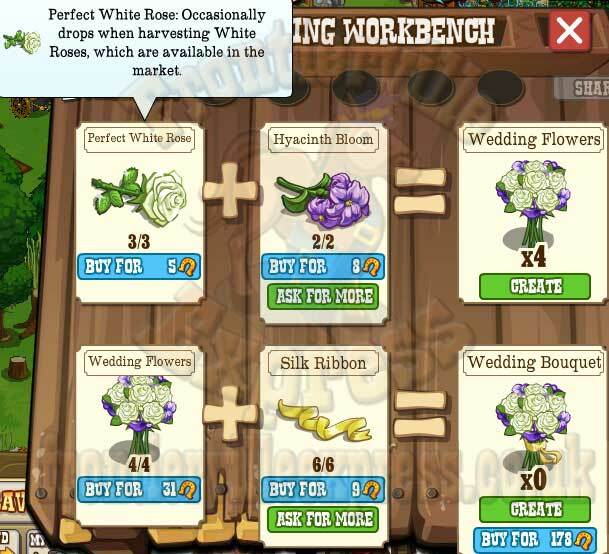 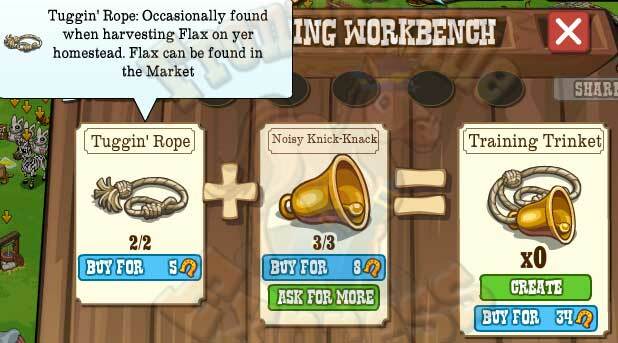 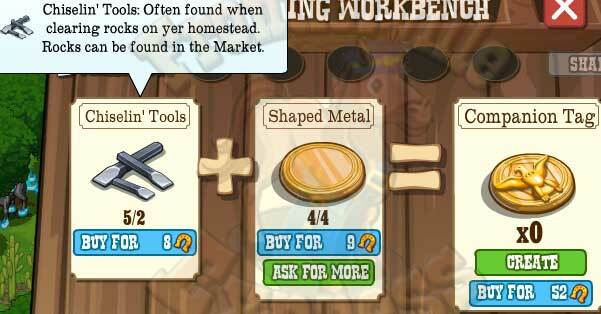 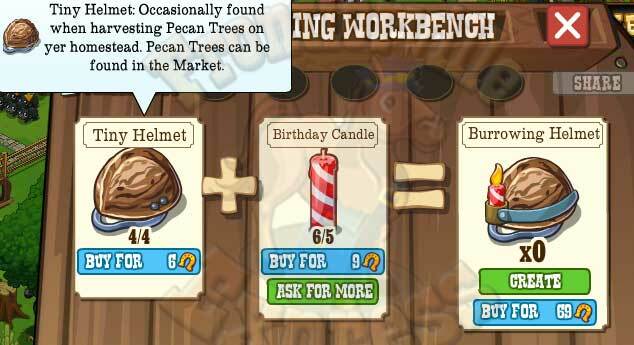 Each job takes a specific crafted item to do. 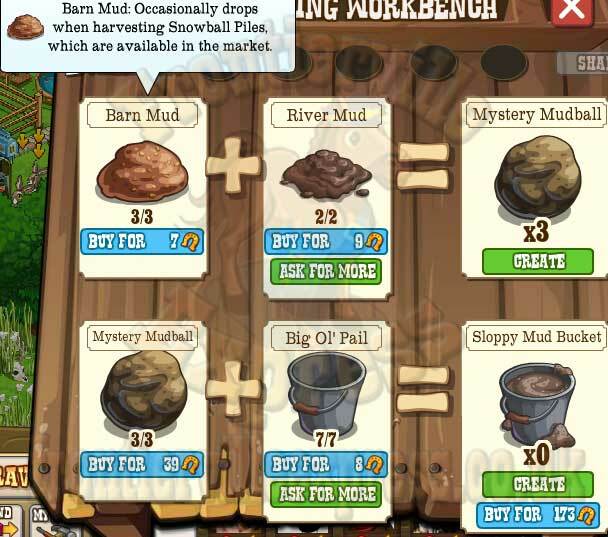 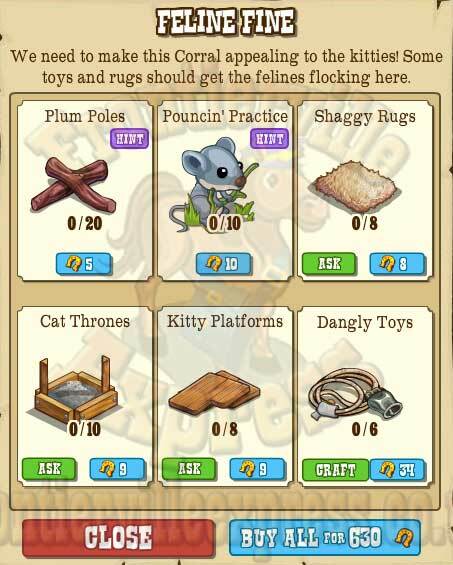 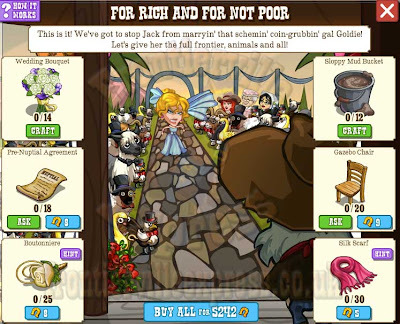 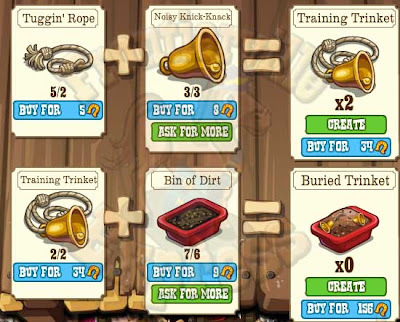 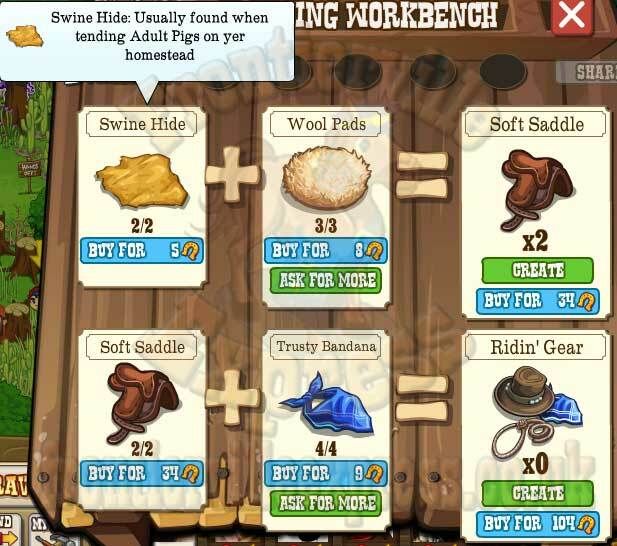 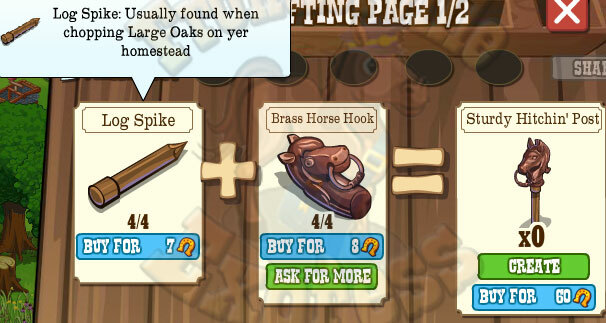 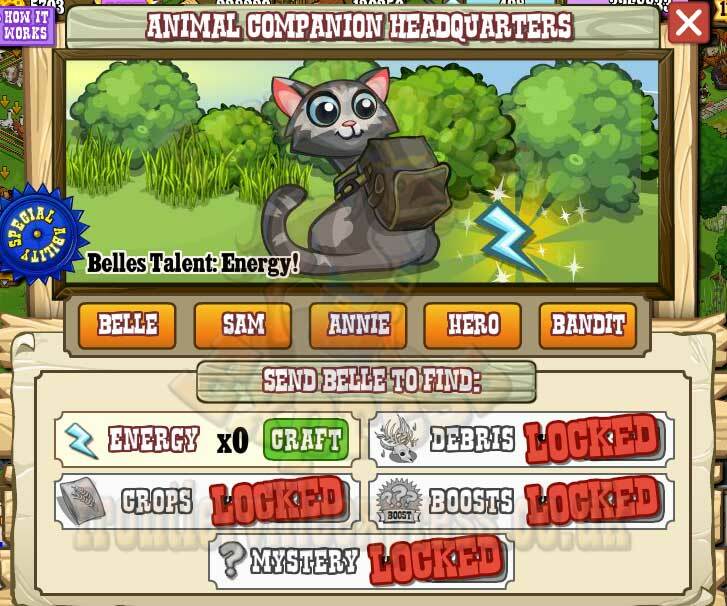 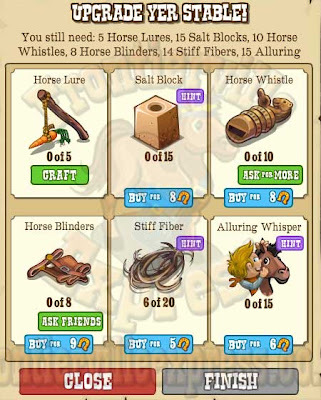 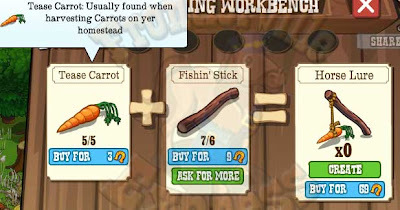 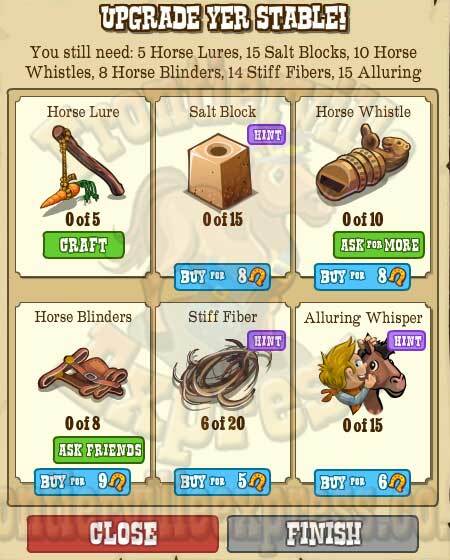 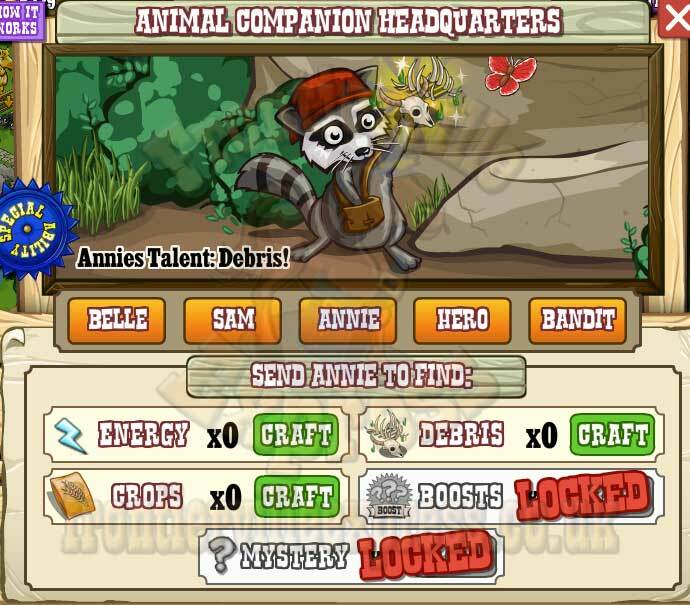 Although ANY animal can do ANY task you get an extra bonus if you use the animal with that item's speciality. 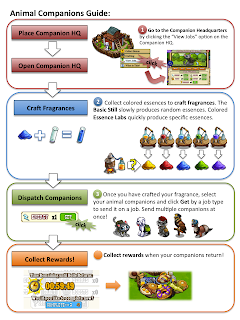 Each Energy mission requires an Energy Aura. Sam the Dog has a 50% chance of getting Energy as WELL as Crops doing a crop mission. 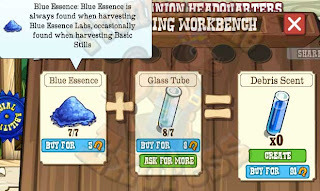 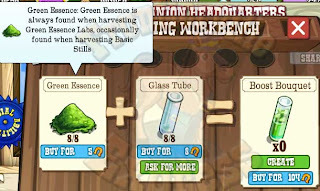 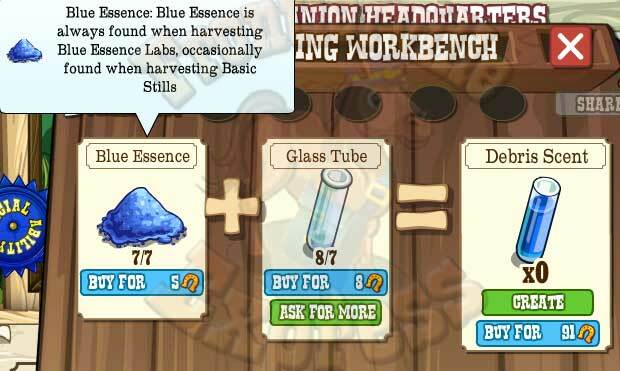 Each Crop mission requires a Crop Essence. 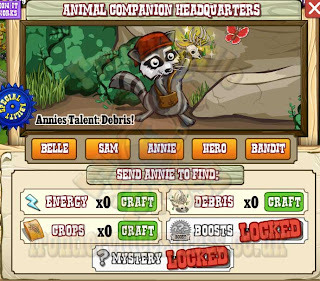 Annie the Raccoon does Debris Missions in half the time of the other animals. Each Debris mission requires a Debris Scent. 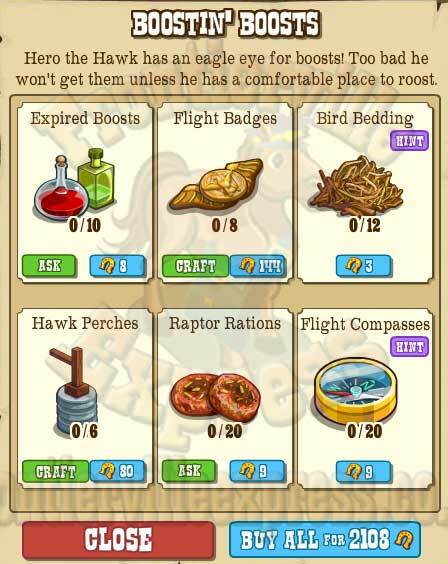 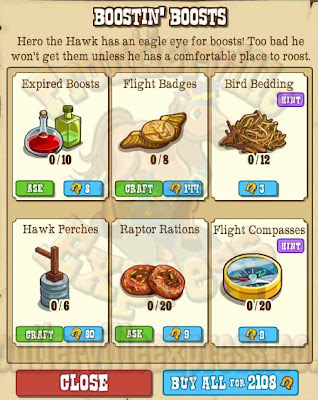 Hero the Hawk has a 50% chance of bringing back double the bonuses on a Boost mission. 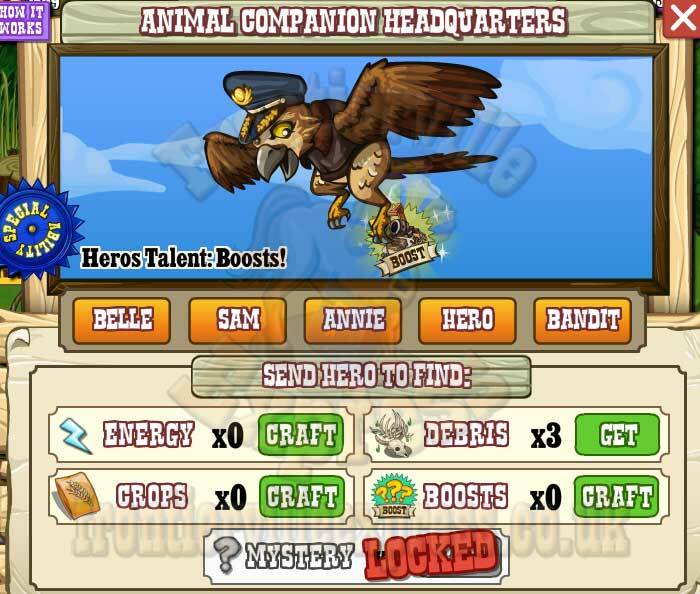 Each Boost mission requires a Boost Bouquet. 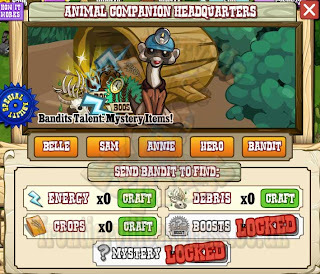 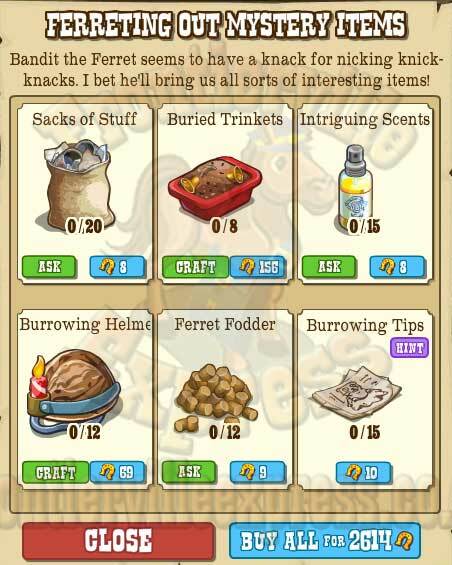 Bandit the Ferret has a 33% chance of brining back Energy, Crops, Debris or a Boost as well as a Mystery Item when doing a Mystery Mission. Each Mystery mission requires a Mystery Odour. 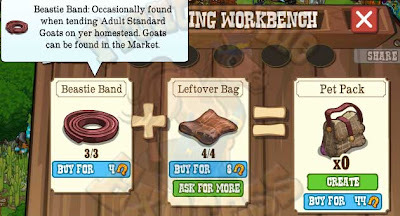 Stables need some work, just ask the Amish... and at least we don't have to pull these up by hand! 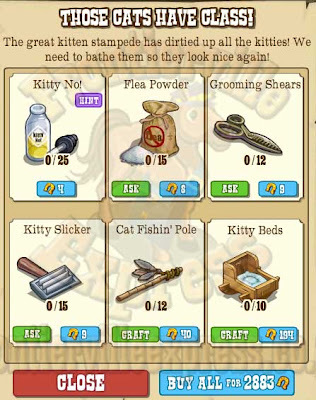 So what do we have to do? Well, we have four stages with the final one repeating to give us more spaces as we need them. It's the traditional mix, requests, crafts and a pleasant amount of homestead drops, so lets get to finding out just what work we have to do for it! 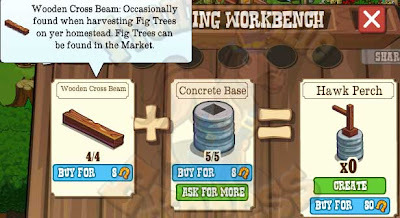 Please Note: This stage is repeatable and gives 8 slots with each completion. 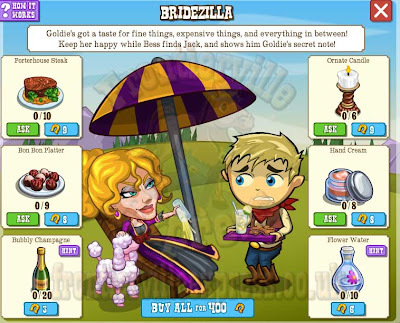 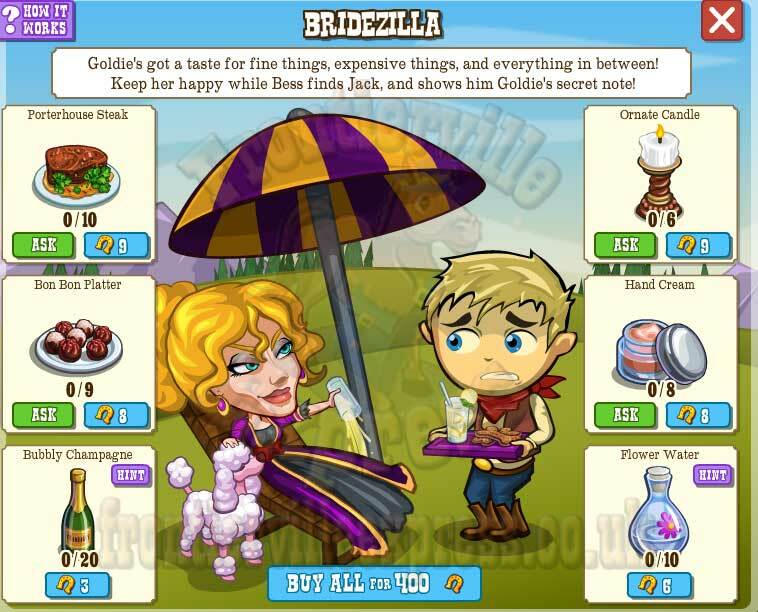 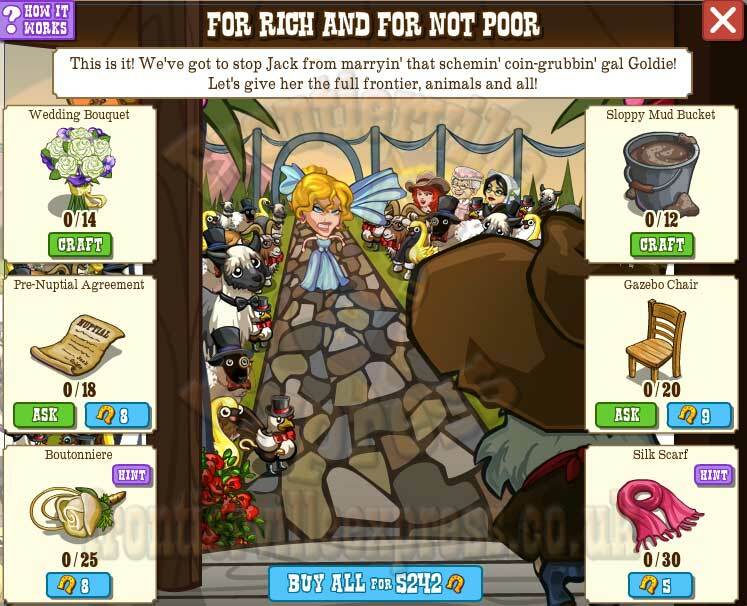 Weddings are never easy to plan, and when you're coping with Goldie the Bridezilla it's even worse! 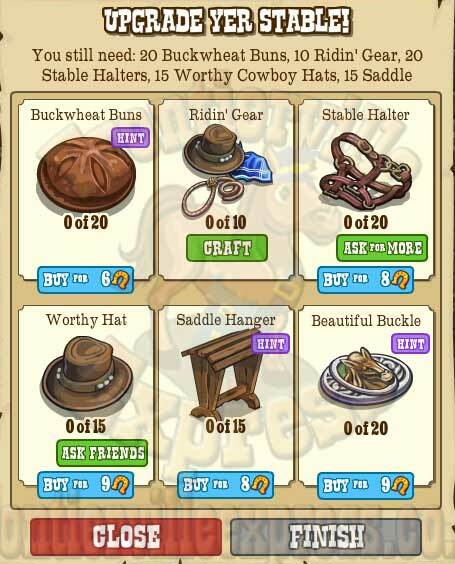 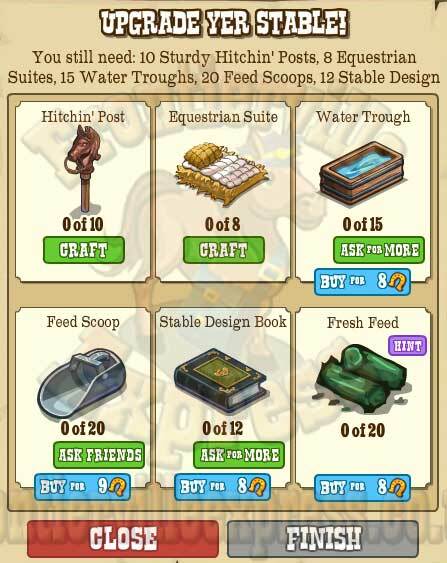 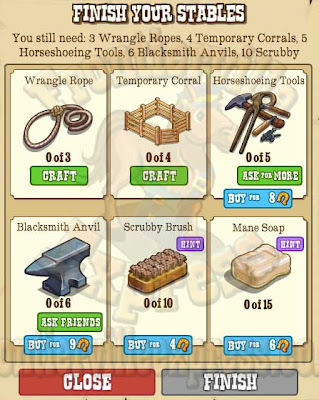 Also note, the craftable items are repeated so we can stock up early! 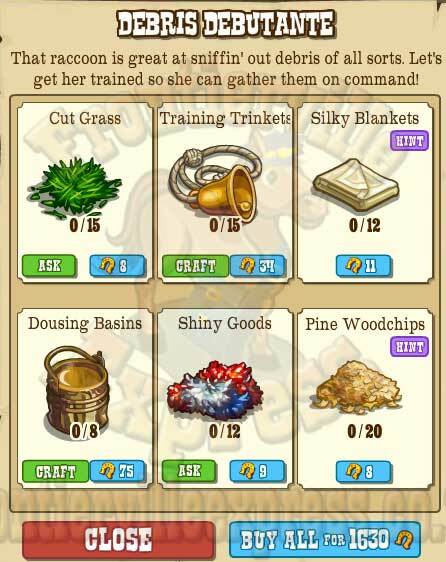 30 Silk Scarf - Geese... wait, geese? Well, not like we have, say, SILK crops. 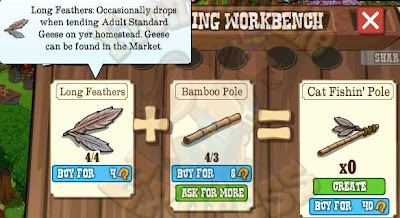 So, geese, ok.